Jump to How to use the wheel. 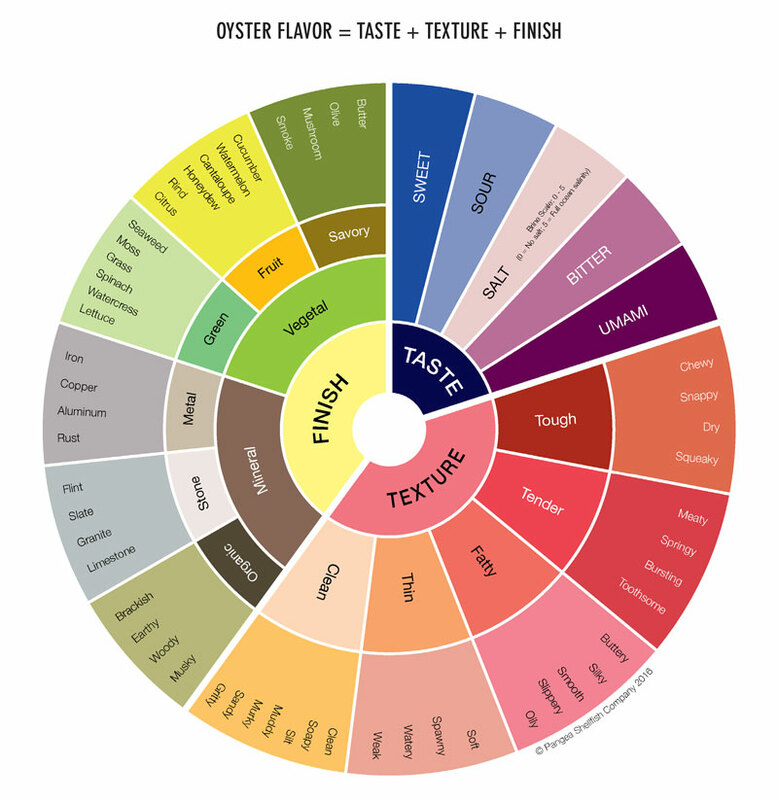 Sometimes it's difficult to describe or even distinguish the taste of one oyster from another, so we wanted to create a tool to help people reference what they are tasting. Like wine, oysters, are greatly influenced by their environments, so they express a lot of that "merroir" through their flavor. There are many flavor wheels in the specialty foods industry (e.g. wine, coffee, and cheese). Some are definitely more complicated than others, but they all try to do one thing, which is to help the taster explain or map nuances in flavor and aroma. When we created this wheel, we wanted to make sure it was comprehensive, but also approachable. We didn't want a mash of words simply in wheel form. Instead, the wheel is meant to be a map that guides the tasting experience from start to finish. We believe that texture is a huge component in describing an oyster's flavor profile and have dedicated a good portion of the wheel to that category. In other wheels, smells before consumption have been emphasized, but based on our experience, it's hard to detect more than an oyster's refreshing ocean smell (unless it's a foul oyster, in which case you shouldn't eat it). Texture, or mouthfeel, can range widely among varieties due to the oyster's species or growout method. Therefore, we wanted our wheel to have a sufficient number of descriptors in this area. Taste can only be five things: sweet, salty, bitter, sour, and umami -- the "protein" taste. Our perception tells us we can taste more than this, but if you were to plug your nose while eating, you would only be able to detect these five things. It is only when we open up our nose, we are finally able to experience the changes in our mouth, also known as the aroma. We can tell the texture of what we are eating through chewing. Chewing creates friction and heat, which intensifies the aromas that are being experienced. When the bite is finally swallowed, some aromas may linger for some time or dissipate slowly, rounding out what we call the finish. With Bekah's skills as a chef and plenty of research, we went through a lot of oysters. We noted different tastes from our own oysters; we looked through Oysterology® information from our vendors; we looked through our weekly interoffice tasting notes; there was a lot of online research; and we even shared it with experts from other specialty foods industries. In summary, the words were pulled from many resources to create a succinct and descriptive wheel. This is the first version of the wheel, so as we learn and taste more, the wheel and its vocabulary will continue to evolve. Start with the taste section. Make sure to note the oyster's salt content by using a brine scale of 0 to 5 (0 being no salt; 5 being full ocean salinity). Follow the wheel clockwise to note its texture and finish. An oyster may have multiple attributes in each section, so make sure you pay attention! If you encounter an unpleasant oyster, faults are built into the wheel. The wheel does not explicitly call out faults because it is subjective, so we include it in the wheel to let the taster to determine for herself. Do not discard the oyster's liquor. We see many oyster eaters who do this, but if you lose the oyster's brine, it will be hard to identify its salt content! Chew the oyster 3 to 4 times. If you throw it back like an oyster shooter, you will completely miss evaluating its texture and much of its aromatic finish. Have a palate cleanser between oysters. Water is always a good option, but alcoholic beverages or crackers work well too. As we mentioned, this is a work in progress, and we will continue to update this as we taste and learn. Please contact us if you have suggestions or feedback for making this version more effective. We would love to hear your experiences with using the wheel or any questions navigating it. We're really excited to share this with you, and we hope you find it useful the next time you're slurping one back!